For my first official musical endeavor of the new year, I will be sailing my band, The Geniuses, into new and uncharted waters. On January 28, we will be bringing our very best selves - our prettiest harmonies, our deadliest grooves, our newest of new songs, our tiniest of tiny instruments - to the Mercury Lounge. We have invited all manner of suit to attend. We have to convince them that we play well with others, and are thoroughly liked by our peers. This is where you come in. We need your pretty faces and funny dances, and most importantly, all your friends and family. Come play with us! 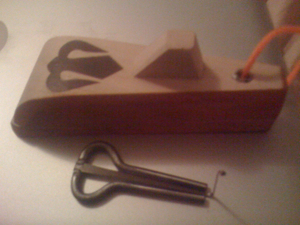 As for the tiny instruments, a fan from Kazakhstan gave me this shankobyz at our last gig. (That wooden Easter Island face is the case it came in.) Thanks Danelle! I promised her I'd work it into the January show. What have I done?